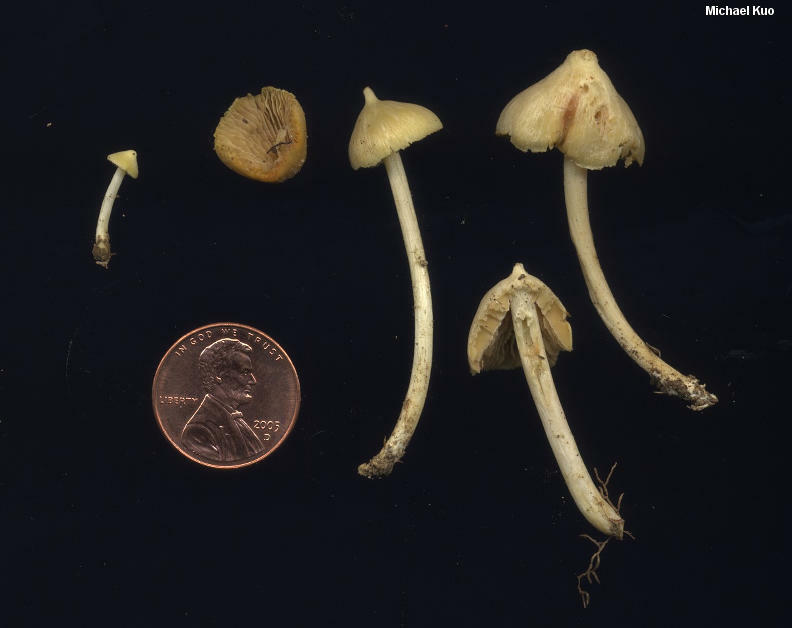 Entoloma murrayi is a distinctive little mushroom. 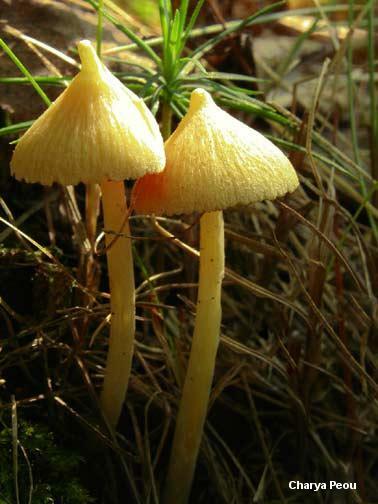 Typically found in swamps or wet woods east of the Rocky Mountains, it has a conical, yellow cap with a prominent, extended point and a silky texture; a yellow stem; and a pink spore print. 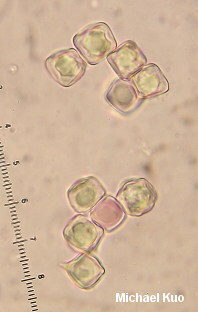 Under the microscope, the species features cube-shaped spores. 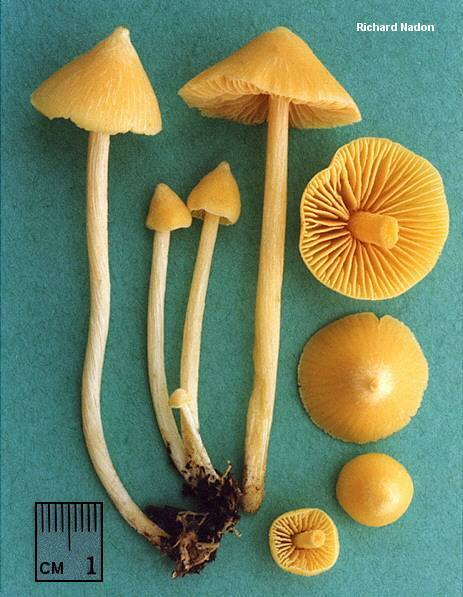 Compare Entoloma murrayi with Entoloma luteum, which is similar but usually more drab and always less pointy--and with Entoloma quadratum, which is pointy, but orange. 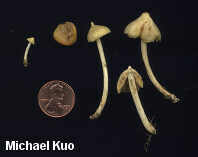 "Entoloma murraii" is a common misspelling. 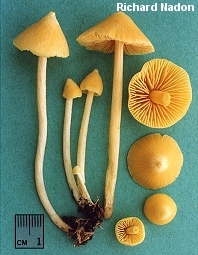 Synonyms include: Inocephalus murraii, Nolanea murraii, Entoloma cuspidatum, and Rhodopyllus murraii. Ecology: Saprobic; growing alone, scattered, or gregariously under hardwoods or conifers in swamps and wet woods; summer and fall; eastern North America, southward to Central America. Cap: 1-3 cm; conical or bell-shaped, with a dramatically pointed center; silky; bright to dull yellow, with the uplifted center often becoming white; dry or somewhat sticky when fresh; the margin becoming lined and/or tattered with age. 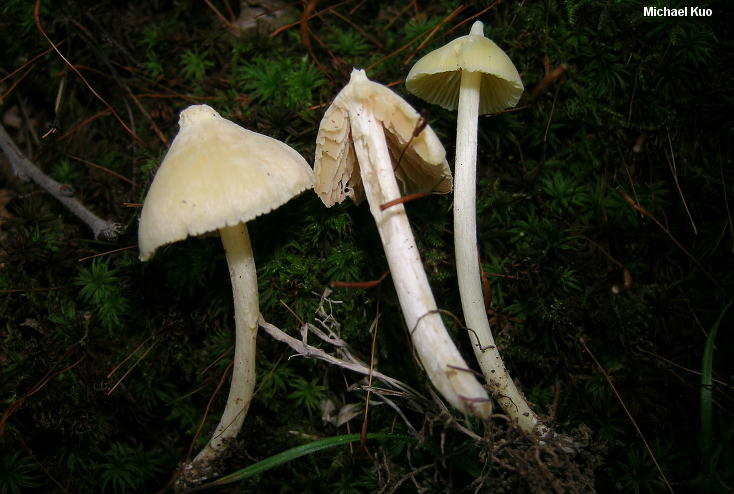 Gills: Narrowly attached to the stem; close or nearly distant; whitish to pale yellow at first, becoming pink as the spores mature; short-gills frequent. Stem: 3-6 cm long; 2-3 mm thick; equal; hollow; fragile; dry; bald; yellow; with white mycelium at the base. Flesh: Thin; fragile; colored like the cap. Odor and Taste: Not distinctive, or slightly radishlike to foul. Microscopic Features: Spores 6-10 µ; cuboid; four-sided in profile; smooth; hyaline. Pleurocystidia absent. Lamellar edge sterile. Cheilocystidia scattered and often clustered; basidiole-like or longer and cylindric-clavate. Pileipellis an ixocutis of non-pigmented elements. Clamp connections absent or very rare. REFERENCES: (Berkeley & M. A. Curtis, 1859) Saccardo, 1899. (Hesler, 1967; Horak, 1975; Smith, Smith & Weber, 1979; Phillips, 1991/2005; Lincoff, 1992; Barron, 1999; Halling & Mueller, 2005; McNeil, 2006; Miller & Miller, 2006.) Herb. Kuo 09029510, 07300902.